The Northern Territory is a hoot. The Northern Territory continues to live up to all our expectations. I know I have said it before, but it really is the last frontier in Australia. It's unspoilt, vast, under populated and in places wild. This place is certainly not for everybody, but if you have a bit of an adventurous nature and like to live on the wild side, you too, will fall in love with the NT. The beginning of the month saw us leave Darwin and make our way to the largest and most visited National Park in Australia, Kakadu, covering an area of 20,000 square kilometres..
80% of visitors to this World Heritage National Park are international visitors. It seems that for some reason Australians give it a miss and then run it down. We have regularly heard this area called "Kakadon't" by Aussies. We visited with an open mind and loved the experience. If you come here and compare it to places like Karijini , Kalbarri or the Bungle Bungles you will be disappointed. The fact is, it's not worse than the others, but it is very different. 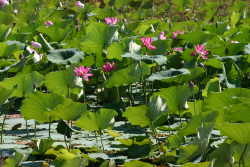 Kakadu is all about wetlands, wildlife, birds, birds and plenty more birds. Water Lillies by the millions, and the sheer enormity of these wet lands is breathtaking. If you intend to visit this area arguably the best time is now, due to the fact that the billabongs are drying up and therefore the wild life is much more concentrated. The wildlife is almost shoulder to shoulder, so thick that you don't know where to look first. A tour guide told us that just after the wet and up to August, the wetlands are so vast you would be lucky to see one bird or bit of wildlife. So it seems that again we timed it beautifully. Our first introduction to the wetlands was Fogg Dam. This spectacular area is actually located just out of the park and was equally as good as anything we saw in Kakadu. We felt like we were in Africa as we looked out over an absolute menagerie of wildlife. Next stop on our way to our campsite was to visit the 'Window on the Wetlands". This National Park's run information centre was extremely informative and educational. It is very interactive and hands on and the boys really enjoyed it. It would be a shame to visit the park without first stopping here and learning a little about how this area was created and what lies ahead. There was so much to see in this first section of the park, that an unscheduled overnighter was had at Kakadu Aurora Resort, which was a very pleasant campground in amongst more wetlands. Our next overnight stop was the Northern end of the park at Merl campground. We again caught up with Wayne, Tracey and Bailey and traveled with them for nearly a week. This will be the last time we see them until we get to Adelaide, as their 12 months on the road is drawing to an end. It will be sad when they eventually head off as we have been traveling with them pretty constantly since April. Many fun times and memories have been shared . So at this end of the park we visited Ubirr Rock, which has some of the best indigenous rock art we have seen, and viewed a sensational sunset perched high on the mountain overlooking the wetlands. It doesn't get much better than this. 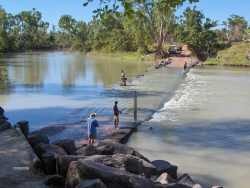 We also visited Cahill's Crossing which is a causeway dividing Kakadu from Arnhem land. What we witnessed at this crossing is something I have never seen before. When we arrived the river was flowing from right to left as the river flowed gently over the causeway towards the ocean. Within 30 minutes of arriving the water on the ocean side of the causeway was rising as the tide came in, pushing salt water upstream. Before long the river had changed direction and was now flowing for left to right. No longer was fresh water flowing over the crossing, now it was salt water. And it was getting deep. By high tide it was far too deep to get a car through and was really hooting, in the wrong direction. As the tide dropped again the river again changed direction and started flowing back out to sea. Pretty amazing stuff. The other amazing thing is the absolute stupidity of some people. As we sat and watched the tide coming in the 10 or so people fishing on the causeway continued to fish, now standing in knee deep water. 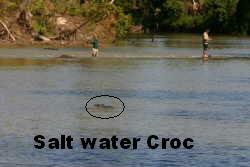 This is a saltwater croc infested water and swimming only metres away from these dopey fishermen were a couple of 4-5 metre salties. Surely a barra is not worth that. Only recently a guy fishing at exactly that spot in knee deep water was taken by a saltie. Even that recent event appears not to scare them in any way. I had the video poised, but no action today. Considering the number of big salties around we are surprised how blaise some people are. Then when somebody is taken the poor croc gets tracked down and killed. Seems a bit strange to me. Friday morning we had the epic 40km trip into Jabiru. 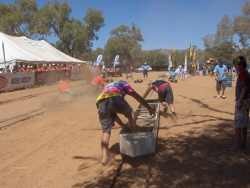 The reason being on Saturday was the annual 'Jabiru Wind Festival', now known as the Mabilil Festival. It started around lunch time and went late into the night. Their main performer was Debra Conway but there was plenty of other entertainment during the day and evening. There was a magpie goose cooking competition, indigenous dancing, basket weaving classes and heaps of street performances. Then there were a few bands that were the lead up to Debra. All in all it was an excellent day. It is really well worth looking at the yearly calendar for the state that you are in and if possible planning your itinerary around these events. We are hoping to be in Alice Springs to see the Henley-on-Todd in full flight later this month. The next day in Jabiru was spent recovering from the late night and then off to the official Kakadu visitors centre. Again this was excellent and gave a great deal of information about the local area. One thing that was very obvious around this area is the extensive damage that has been caused by Cyclone Monica in late April this year. The cyclone made its way straight over Jabiru causing extensive damage, mainly to the trees. In places more were flattened than are standing. It will take many many years for this area to regenerate. Next it was off to the Southern end of the park. We ended up staying at Cooinda Resort in an unpowered site as it was getting hot and the beautiful pool looked very inviting. It was also Harry boys birthday while we were here so being in civilisation made the preparation and party a little easier. He had a great day and we managed to find a few stray kids for the party. Made the games a little more fun, although a bit harder to win. From here we did the famous Yellow Waters 2 hour Cruise which was well worth the expense. Plenty of bird life and big salties to keep everybody happy. Although only 50 kms from Jabiru this end of the park is very different to the Northern end. Less wetlands and more spectacular gorges and large natural pools (mostly unfortunately full of salties). We visited Maguk, Moline and Gunlom Falls which are all extremely beautiful. 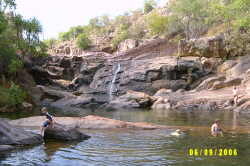 Maguk and Gunlom have swimming holes high above the main plunge pools which are not accessible to the crocs. 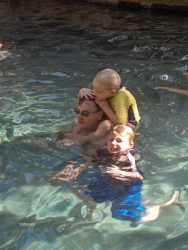 After the strenuous climb to both, the swim was a well earned reward. The other place we ended up seeing that we thought we would miss out on was Twin Falls. The reason being you had to do a 900mm deep water crossing and we unfortunately don't yet have a snorkel on the car. But Wayne does, so when we got to the crossing we all piled into their car for the final 10 kms. There is no doubt it is spectacular but I think the fact that we didn't think we would get to see it made it more exciting. Not only do you have to do the water crossing (that can be over 1400mm deep after the wet) but you then have to catch a boat to the falls. A couple of years ago you used to float down the river on air beds but the salties that now live in the river have put a stop to that practice. In all we spent just over a week in Kakadu NP, and yes it is very busy but that should not deter you from visiting this very special part of our country. To all those knockers, go in with an open mind and enjoy it for what it is, not for what you want it to be. Next stop Katherine and to see Mitch Trulson, a friend from Bundaberg who now lives here and works at Tindal Air Force Base. It was really great to catch up with Mitch again and to meet Lenice and their new baby Tayliah. We went to their house at the base for a lovely dinner and had a great night. Mitch had also kindly offered to take us all on a tour of the base. Yet another opportunity that money can't buy. As you can well imagine we were all very excited. It had taken Mitch nearly a week to get us cleared to enter the base. Well, this place is amazing. It is huge, really neat and tidy and fascinating with a staff of around 1,000. There is almost nothing to do with F18's (It is actually called an FA-18 Hornet) that can't be done on base. F18's are small compared to F1-11's but when up close and personal they are big. These things are worth $60 million each but if you are in the market there was one recently on EBay for a bargain price of $20 million. Scattered around are 12 hangers called OLA's. In each of these domed shaped structures they can fit either 2x F18's or one only F1-11. Australia has around seventy F18's shared between Tindal and Newcastle Airbases. 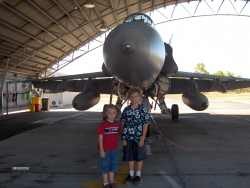 In one of the OLA's the F18 had one of it's engines out so we were able to see what makes these things go so fast. 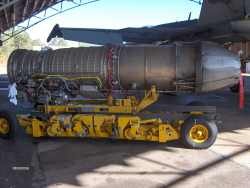 A jet engine looks like a fairly simple concept but I am sure it isn't. These would have to be the ultimate toy. Mitch was lucky enough last year to score a ride in one. His boss walked into his workshop and asked 'Who is up for a sh-t job'. Mitch put up his hand and said he would do the job, having no idea what it was. The sh-t job turned out to be flying in a two seater F18 from Amberley to Townsville and then onto Tindal. As you could well imagine he says that was the highlight of his military career. During the trip he even had the opportunity to actually fly it for 45 minutes while the pilot had his lunch. That would have to be worth signing up for. The motto of the story (at least this time anyway) is always volunteer for the sh-t jobs and one day you might get rewarded. After we had finished sightseeing Mitch then took us to the Latham Club which is their mess and recreational facility (which is still on base but outside the secure area) and had a beer at the Tindal Fishing club. We met some of his mates and had some great laughs while the kids played on the playground. There were some real funny buggers amongst them, living there with their families and just doing a job. It was a great day and one that we will remember forever. Thanks Mitch. Other things we did in Katherine included visiting the Cutta Cutta caves, which are a tropical cave about 30kms out of town. The difference between a wet and a tropical cave is that the tropical caves are only wet during the wet season, the remainder of the year being dry. This means that the growth of the formations is slower taking about twice as long as those in wet caves. During WWII the military took over the caves and amongst other reasons used the stalactites as target practice. Hard to imagine but true. Regardless of that the caves remain spectacular and well worth visiting. Of course you can't come to Katherine without visiting the Hot Springs. While not actually hot they are also not cold so we all had a swim. Alex and Harry met up with a couple of young indigenous boys and they all had a ball, laughing, jumping and swimming around the spring. 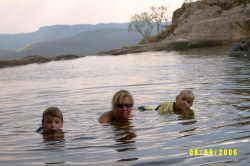 We spent a little more time there than we expected before moving the 30 kms up the road to Katherine Gorge. Not another gorge! This is a very well run and organised indigenous owned and operated establishment. It has a very nice camping area complete with power and hot showers, a very good information centre complete with coffee shop and of course the Gorge. It is difficult to see much, if any of the gorge without doing a boat trip. The 2 hour trip is reasonably priced and very informative. Unlike other gorge trips we have done, this trip requires you get get off one boat, walk a distance and then get into another boat. This is because this gorge is divided into 13 different sections, all divided by natural rocks and rapids. We only did gorges 1 & 2. To see beyond gorge three you either need to paddle a canoe for a few days or take a helicopter flight. We did a couple of short walks, socialized with Gail and Tony who met up with us again and rested (how dare we)! We have now started the great trip south. From now until Alice Springs, 1066km away, it is very isolated. Mataranka is a very small town who's existence is due to the hot thermal pools. There are a number of caravan parks in town but the one at the actual springs is the Homestead. It is a funny old place with cabin and caravan sites, a bar and restuarant. We sat at the restaurant and watched the daily viewing of "We of the Never Never". It was in this area that the family in this book then movie actually lived. The Gunn family is actually buried in a small cemetery in town. 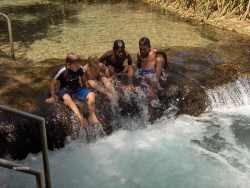 The springs are only a 3 minute walk from the camping area and are as good as any we have seen, be them a little man manipulated. The story is that during the war, the enlisted men constructed the rock wall and steps into the pools for the exclusive use of the officers. It has a nice sandy bottom, is crystal clear and warm. Very pleasantly warm in fact. We spent a few hours splashing around amongst the multitudes and chatting to others who are 'on the road'. It is amazing the amount of information you get from these chats. At the other end of town is 'Bitter Springs'. These are also hot but not man manipulated. 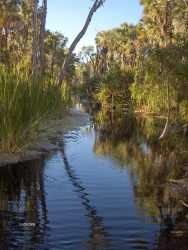 It is a natural narrow creek. We took our snorkels and masks and drifted down the creek , probably about 150 metres. This is extremely pretty with fish and water plants everywhere. It was a bit like swimming around in a large aquarium. The water was incredibly clear, but the surrounding swamps did have a bit of a smell about them. One night in mighty Mataranka and then on the road again. How does a place like the 'Daly Waters Pub' get such a high profile? It is a very small town in the middle of nowhere that you actually have to detour off the highway to get to, but a place that everybody visits. We camped in the campground attached to the pub, that was nearly full and this is the off season. You would never get in during peak season. The pub itself is very old, very basic but full of great Australian charm. It is absolutely unique and a little hard to describe. It is a little like Finlays Seafood restaurant in Kalbarri in in that it has memorabilia everywhere. Where this differs is that the hotel patrons leave articles to decorate the walls, roof and floor. Bras, knickers, boots, shirts, money and even a breast prosthesis, and anything else that you could imagine is there. It dusty, it's dirty but it's great. Chris had left her good Colorado sandals in Waynes car. As they had left us they decided to leave the shoes in the pub for us to collect. We had to search for them. Not any easy feat. We did locate them and they had been hanging there for over a week. A wonder nobody pinched them!! We did text Tracey and told her they had been flogged. Got her in a real flap. She really shouldn't believe anything we say. From now to Alice there really is a lot of 'not much to see'. 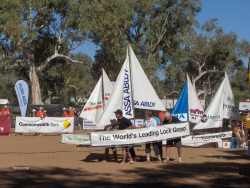 Our aim was to get to Alice by Friday so we could attend the 'Henley on Todd' regatta on Saturday. 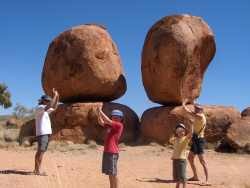 On the way down we stopped and saw 'The Devils Marbles' which are huge granite boulders. Millions of years ago this area was huge blocks of granite and sandstone. 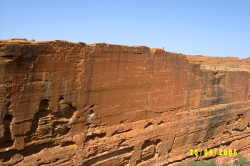 Over the years the sandstone has been eroded away by wind and water leaving the harder granite exposed. It certainly does make for a spectacular backdrop to an otherwise flat landscape. 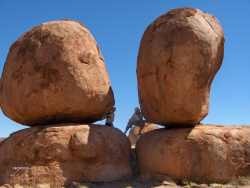 Of course you can't visit these boulders without the 'Look how strong we are' photos. The mighty Alice. The town that is closest to every beach in Australia. Once again I had a mental image, this time of beer cans piled up 30 foot high everywhere you looked, of a dry and desolate dust bowl. Wrong yet again. Alice is bigger than we expected (Pop around 29,000), is green and very clean and tidy. The only beer cans to be seen were around the door of our van (must have been Tony). In fact it would have to be the most picturesque inland town we have seen yet . The MacDonnell Ranges virtually surround the town with only a narrow opening (Heavitree Gap) allowing you to exit town to the south (see photo on 'Cover Page'). Through this gap, which is only about 200 foot wide runs the highway, the Todd river and the rail line south. It is a fairly congested little number. 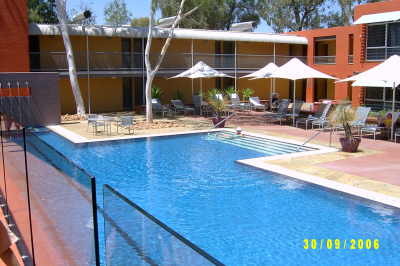 There are at least 6 caravan parks in town and after a quick look at a few we settled on 'Heavitree Outback Lodge' owned and operated by Aurora. We have now stayed in a few of their resort/ caravan parks (in Kakadu and Jabiru) and have found them all to be extremely good value and very well appointed. It cost us only $20.00 a night, with the Big ? next door being close to double that price. And guess what, the office staff were even friendly. You don't see that every day in a caravan park, let us assure you. Good value, adequately appointed and with friendly staff, it is a fairly simple recipe to a successful business you would think. Only 2 days ago, on our way to Alice while travelling with Gail and Tony we stopped at a Roadhouse /Caravan Park in the middle of nowhere which happened to be another Big ?. We were looking for somewhere for the night, so in we went. This park was completely empty and the price quoted per van was $35.00. I let out a laugh and asked could he improve on that a little. His response was, 'that is our price'. Can't work out why the park is empty?? ?.After letting out another laugh, we used their toilet, used their bins and left. So good on you Aurora. Keep it up and if you are on the road, keep an eye out for them. 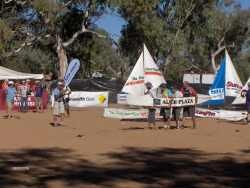 The timing of our arrival in Alice was beautiful as the next day was the annual 'Henley on Todd ' Regatta. I can remember as a kid watching this crazy race on telly and thinking how much fun it would be, to be there. Well boy, I was right and it was. We had an absolute ball from the minute it started until it finished. What made the day so much better was being here with friends. Tony, Gail and the boys who we met in February in Esperance and Guy, Sally and the girls who we first met at the Bungles, a couple of months ago. This was such a well organised and run day. It started at 11-00am with the street parade. That really set the scene for the rest of the day. After the parade it was a 2 minute walk over the road to the lovely park overlooking the Todd. Entry was only $10.00 per adult, children free. What made it so much fun was that all the necessary equipment that was needed to enter the events was supplied. Bathtubs, kayaks, 4 and 8 person boats and plenty more. There was in fact only one race in the whole day where you had to supply your own craft. Well, in true 'Woody' fashion we cheated and schemed and with very little skill and not a lot of talent managed to get into about 4 finals. I really wanted to win two events so the boys would have a 'Henley on Todd' medal for their journals. I even filled in for a few teams who were short in the hope of winning at least one. Then on our final race the other team forfeited so we got one medal! The other medal I simply pinched off the table as they had plenty left. Yeah I know, that's not very honest but I did it for my boys!! 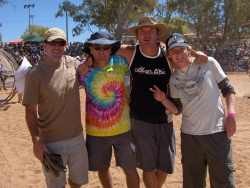 In all we spent 7 days in Alice and other than the day spent at the regatta and one visiting the East MacDonnell Ranges, all we did was look around town, shop and visit a few local sights. Finally after 9 months on the road we managed to be in the same place at the same time as David, a friend from Brisbane who flies for Qantas. Even though he was only free for 15 minutes between flights it was good to see him. We will be able to catch up for a bit longer at Cotton Tree at Christmas. 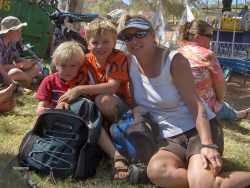 We left Alice and relocated to the West MacDonnell Ranges, camping at Ormiston Gorge. In the 2 days we were here we visited and walked Simpson's Gap, Ellery Creek Big Hole, Ormiston Gorge, the Ochre Pit, Glen Helen Gorge and Redbank Gorge. We gave Standley Chasm a miss because they now charge $23.00 to do the 15 minute return walk. A little steep we thought and to be perfectly honest we are all a bit Gorged out. Maybe next time. 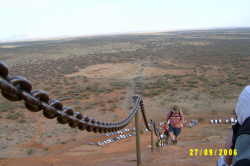 From here we will go to Ayers Rock (or Uluru for you young ones), the Olgas and then on to Kings Canyon. They will definitely be a trip highlight and we are all looking forward to finally getting to the rock. 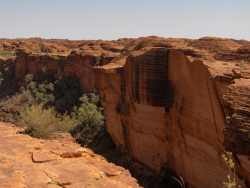 We stayed at Kings Canyon Resort for 2 nights and did both the walks. The first was a short walk into the canyon and the second was a 6 km walk around the canyon rim. Had we only done the short walk, and not the rim walk we would have gone away with a very poor impression of this area. The rim walk, be it a little tough in places, was really excellent and should not be missed if you come all the way out here. The sheer walls of this canyon with their kaleidoscope of colour have to be seen to be believed. To then enter an area of tropical rain forest and lovely cool swimming holes out in the middle of this desert was bizzare. In parts this was an extremely dangerous walk with 100+ metre sheer drops at every turn with not a fence or barrier anywhere. Of course if you stayed well back and were sensible there was in fact no danger at all. Now bring in the foreign backpackers. (We are sure Aussie idiots do this as well but we didn't see any.) The things we saw these young people do was enough to scare the pants off anybody. Standing on thin overhangs, totally ignoring the warning signs or sitting on the cliff edge on loose fragmented rocks with their legs hanging down, all for a great photo opportunity, was unpleasant to watch. I did have the video poised for any falls but luckily for them, today was not the day. The most annoying thing is that a lot of these walks will eventually be closed because of accidents, with loss of life and the expense of rescues being the main issues. If these idiots didn't take these ridiculous and unnecessary risks nobody would be injured or killed and these places would remain open for future generations to enjoy. The Resort we stayed in was really nice and we enjoyed our few days here. We even managed to find the time for a swim. 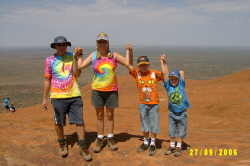 The weather prediction was spot on and the weather did stay cloudy and windy but off to Ayers Rock/ Uluru we went. Fingers crossed. Now let me start with the resort - Ayers Rock Resort. This place is truly amazing and unless you have been here you will have trouble grasping the incredible size of it. 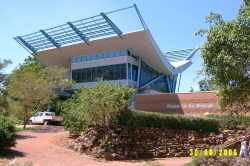 In fact it is so big that it actually rates as the 4th biggest town in the NT with 980 staff and 4,000 guests. True story. The total resort must cover more than a 1,000 acres. You actually need to drive or ride a bike around, it is so big. It has been very cleverly planned and is very well laid out. In the accommodated section there are 5 different resorts. Each resort has its own reception, pool and beautifully manicured gardens. They range from moderately expensive to bloody expensive. Then there is the shopping area. It has everything from a supermarket to hairdresser. There is plenty of food outlets and a sail covered quadrangle with tables and chairs, complete of course with a fountain. The resort complex has its own school, police station, health clinic (doctors, nurses and ambulance) and fire brigade. I kid you not, this place has to be seen to be believed. Then there is the caravan and camping section. It too, has its own reception, shop, playground, pool and numerous toilet blocks. It is really well laid out, spacious sites, clean and tidy and very well maintained. By no means is it the poor or shabby end of town. I think what we liked most about the whole place is that you are not made to stay in your level of accommodation. It is made very clear to you that you are a valued guest and you can use any of the facilities that are on offer. That means that if you wish you can go over to the expensive section (Sails in the Desert) and splash around in their pool, complete with complimentary pool towels. (Pic to right is The Lost Camel Resort). Hob-nobbing it with the rich and famous. Right up my alley. By the way, there is nowhere else to stay close to the rock, other than here. The next closest is Curtain Springs which is 80 kms away. Now the rock. This is absolutely one of the most amazing sights I have ever seen. A million photos that you have seen over a lifetime will not prepare you for the first sighting. It is so awe inspiring that it brings a tear to your eye. It stands majestically in an otherwise flat, desolate landscape. It has no competition, not here, not anywhere. It is a one-off, it is breathtaking and an Australian icon. People travel from all over the world to see this monolith and nobody walks away disappointed. It stands 348 metres above the plain and has a circumference of 9.4 kms. It is estimated by Geologists that the rock continues for about 6 kms underground. It is seriously big and a walk or drive around the base puts it into perspective. So back to us, which is of course what this web page is all about. The weather was crap and according to the forecast was not going to improve. Well lucky for us the weather forecasters are rarely right and the next day we woke to a perfectly clear sky and not a breath of wind. Like some sort of crazed madman I jumped on the bike and rode off to reception to see if the rock was open. Now before I go on I will explain about the rock being either opened or closed. Up until recently the rock was always open which meant you could climb it rain, hail, wind or shine. The number of injuries and rescues was high. The National Parks then introduced a system where the rock would be closed (for climbing only) if the forecast temperature is over 36 C, if it is raining or rain is predicted within 3 hours, if the wind speed at the summit is more than 25 knots or if cloud descends over the summit. These sensible safety measures have dramatically reduced necessary rescues from the rock. Of course people do occasionally drop dead from heart attacks while attempting the climb which I believe should not be viewed as a negative or a reason to close the climb permanently. These same people would most likely still die whether they are climbing the rock, watching TV or sitting on the toilet. Should we ban the use of toilets just because people die on them? I think not. To see the 'Climb Open' sign in reception almost pushed me over the edge. At some sort of world record pace I cycled back to the van and woke the family. It was panic stations all round. I was panicking about getting there before it was closed again, and Chris was panicking even more about facing her fear of actually doing the climb. Although she was determined to do it she was not at all comfortable with the idea. The bags had been packed from the previous day with 6 litres of water and snacks, sitting in the car, ready to swing into action at a second's notice. We stuffed some breakfast down our throats and off we went. Luckily this chain of events happened so quickly that Chris didn't have time to get to nervous. On the advice of Tony and Gail who had done the climb a week earlier we took a 3 metre strap along that we tied around Harry's waist and to my wrist for the initial ascent. Now we have all heard about the chain. Well to get to the chain you have to first get past 'chicken rock'. There is no gradual build up to the steep part, it starts right from the bottom. Chicken rock is where a lot of people pull out and give the idea of climbing away. The chain section is very long, very steep and in places very slippery. In a few sections if you moved only 3 feet from the chain you would fall off the edge. And let me tell you, from the edge to the bottom is a very long way. It was on these bits that we were glad to have Harry tied to me. We would have stopped at least 3 times during the chain ascent for a drink and rest. At the top of the chain, we had made it to the 1/2 way point. The second 1/2 although not as steep was still long and in places difficult. We all did the walk fairly easily with the boys doing it without even a puff. I loved it and Chris surprised herself. We all knew she would do it easily but try telling her that. The feeling on reaching the summit was pure excitement. Finally, we stood on top of the rock, proud of our achievement and having completed a long time ambition. An hour sitting on top admiring the view, texting friends and 200 photos later we started the long descent. Boy was it easier than going up. We were about half way down the chain and all was going well when a very nasty wind storm hit. We sat down and had to hang onto the chain with all our might until it passed. Harry lost his hat and Chris lost about 10 years but we all survived to tell the story. In all we had 5 nights at the rock. We saw it rain, be it not much, saw it blow and also saw it at it's best. We went to a couple of famous 'Rock' sunsets, one cloudy and one beautifully clear. 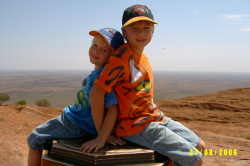 Our others days were spent walking part way around the base and doing the 'Valley of the winds' walk at the Olgas . On our last day Alex and myself did the climb all the way to the top again while Chris and Harry went to the cafe at the Cultural Centre. I am not sure why I did that because the second time was much harder, for me that is, Alex did it with ease. So the 'Rock' in summary. This is a place that every Australian really should visit at least once in their lifetime. If you ask any foreigner what they know about Australia, the answer will almost always be kangaroos and Ayers Rock. This is a significant part of what we are, and really shouldn't be missed. If you have already seen it, you too are one of the lucky ones. If you haven't do yourself a favour and make the effort. I promise you won't be disappointed. 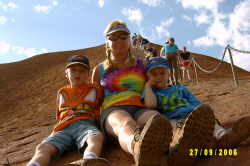 Next stop will be Coober Pedy. This is yet another very unusual part of this great country and should be very interesting. Stay tuned. Hard to believe but that is the end of another month. They seem to be going faster and faster. It will be Christmas before we know it. The end of September saw us leaving the Northern Territory. We have spent exactly 2 months in the Territory and loved every minute. This place is unique. It is like the rest of Australia was 30 years ago. Nobody is in a rush and everything moves at 'Territory pace'. Let me assure you, that isn't fast. The people are friendly, the country harsh but at the same time beautiful. The Territory is a place we could really seeing us living for a while. Like WA there is a tonne of work available, regardless of what you do. The biggest problem you would have up here is not would you get a job, but which one of the many you would choose. I am sure I have said it before, but why we all live cramped in the eastern states is a mystery. 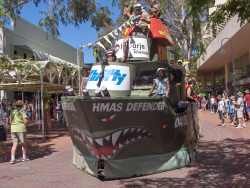 Of course the people in WA and the NT would like us all to stay put. Can't blame them. A few stats for those interested. We have just completed week 42 on the road and have just passed the 30,000 km mark. Our average fuel economy has risen slightly to 18.2 litres/100kms probably due to a few head winds lately. We have now set up camp in 91 different locations. Let me tell you we are getting pretty bloody good at setting up camp. We now have it down to a fine art and often get comments from other travelers. Our average distance traveled is now 711 kms per week. Fuel prices have continued to be better than expected with the average price being around $1.61 cents/litre but has been improving lately. The other day we paid $1.25 litre with the most expensive this trip being $1.87 litre. Car and van going well. Family even better. Keep in touch. We love the phone calls and emails. People on the road are judged for who they really are, and not by what they own, how they look or by their fancy job titles.